I’m a long-time admirer of Dystopian Cinema -- movies about morally, culturally, and economically bankrupt “future worlds” -- and thus I was very much looking forward to The Hunger Games. We saw similar gladiatorial games in Death Race 2000 (1975), Rollerball (1975), and The Running Man (1987) to name only a few. Mad Max: Beyond Thunderdome (1985) and The Blood of Heroes (1989) also feature material of a similar nature, showcasing worlds where life-and-death “games” are the law, and, not coincidentally, the only avenue by which to achieve independence from the corrupt state. The Hunger Games develops its tale of the futuristic blood sport by comparing the games not to the world of professional TV sports (like Rollerball) or TV game shows (like The Running Man), but to a more timely topic: reality television show competitions. Not unlike American Idol (2001 - ) or Dancing with the Stars (2005 - ), the story’s violent annual “Hunger Games” make a celebrity of a resourceful contestant, while other, perhaps-equally resourceful youngsters also vie for the crown and fleeting fame. And not unlike Survivor (2000 - ) alliances are forged during game play, presumably to be broken as contestant attrition sets in. Meanwhile, producers and other behind-the-scenes players keep changing the rules to make the show a bigger “hit,” and one more appealing to the audience at home. The Hunger Games combines its apropos commentary on reality TV contests with some very vague political commentary. I’ve seen the film described in print as a both a metaphor for the Occupy Wall Street Movement, and as a right-wing anti-government screed. 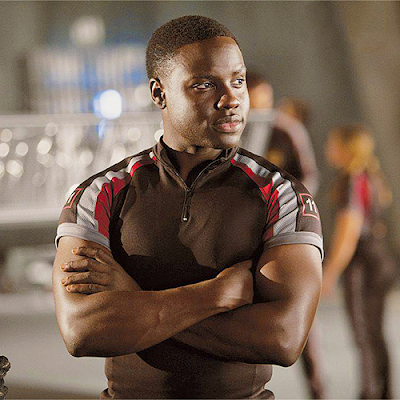 The phrase I just used -- “very vague” -- in fact, captures much of what’s amiss with The Hunger Games. Although the film is undeniably buttressed by a forceful lead performance from Jennifer Lawrence and a welcome lack, overall, of sensationalism, the film’s future world never quite seems believable or genuine. Instead, it comes off as half-baked. Too many factors here -- too many ideas – are left purposefully vague, and therefore the film is neither the searing satire of our modern culture that it could be, nor the heroic poem that some critics view it as. In other words, the filmmakers often back away from the "core" of the material, and don't play it for all it is worth. This movie should be about America in 2012, about the qualities we ask of our our "stars," and the ways we broach fame. Instead, The Hunger Games is about none of those things, at least not in a fashion that is cerebral or intriguing. In the oppressive future state of Panem, the insurrectionists living in twelve poverty-stricken districts are required every year to give up two “tributes” -- a male and female each between the ages of twelve and eighteen -- to participate in a life or death contest called The Hunger Games. In District 12, resourceful Katniss Everdeen (Lawrence) volunteers to be a tribute for the 74th Annual Games after her innocent young sister, Primrose (Willow Shields) is selected on the day of the Reaping. She takes her sister’s place, and steels herself for battle. Katniss joins Peeta Mellark (Josh Hutcherson), a boy in District 12 who harbors a crush on her, for the journey to the Capitol City. 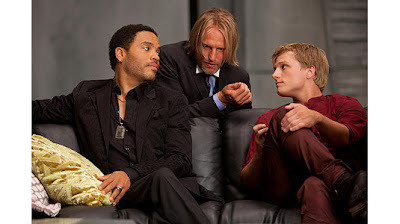 Soon they meet their mentor for the games, one-time winner Hayitch Abernathy (Woody Harrelson), as well as image advisors Effie Trinket (Elizabeth Banks) and Cinna (Lenny Kravitz). Before the games commence, Katniss and Peeta train with their fellow contestants, learning their strengths and weaknesses in the process. They are also introduced on TV by the Hunger Games host Caesar Flickerman (Stanley Tucci). 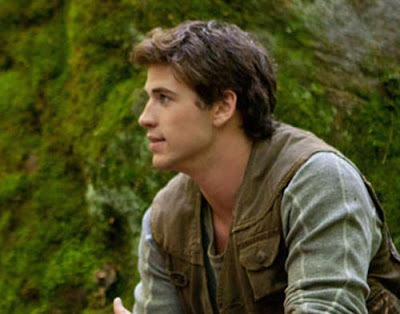 Katniss makes a splash with viewers, and Peeta admits on-air that he is in love with her. I have not read Suzanne Collins’ young adult novel, The Hunger Games (2008), or any of its follow-ups so I cannot, alas, comment meaningfully on whether or not this 2012 film represents an adequate or faithful adaptation of the literary material. I can only study the film as a movie-going experience and as a complete visual and thematic work of art. Therefore, my observations in this review will focus on those aspects rather than judge fidelity to the literary source material. In brief, I found the film’s two primary strengths to be its sense of earnestness and the central performance by Jennifer Lawrence. The Hunger Games never feels gimmicky, slick, or sensational, and Lawrence projects fortitude, sincerity, and intelligence as the film’s protagonist. When the movie succeeds, it’s because Lawrence is riveting and even magnetic as Katniss Everdeen, and because the filmmakers generally take the subject matter seriously. On the surface, it all seems very impressive, if overly straight-forward. When The Hunger Games fails, I assess, it’s largely because the dynamics of the dystopian world seem unnecessarily vague or inconsistent. We see this sort of “muddle” throughout the film, and therefore it is difficult for The Hunger Games to speak meaningfully or even directly to its audience regarding theme or meaning. For instance: politics. The film is either an Occupy Wall Street film, about the rich 1% lording it over the poor 99 percent, or it is a film about the fear of over-reaching, outwardly benevolent but really malevolent government. The Hunger Games attempts to straddle the line between those red state/blue state viewpoints, but only ends up with a wide stance, if you get the reference. In other words, the audiences can’t judge the film’s perspective or viewpoint on the world. Is it the rich elite who made the world a hell? Or overreaching government? In the end, it all just comes across as kind of, well, simple-minded. What we are left with is that evil government is evil, decadent people are decadent, and good citizens are good. That's as deep as it gets. The film is smart enough to tap the Zeitgeist, but it can't commit to a specific aspect of that Zeitgeist. We see the same problem recur with Katniss and Peeta. Do they actually love each other, or is it all a show for the cameras, just like on The Bachelor or Joe Millionaire? In the end, both Peeta and Katniss play up the star-crossed lovers angle to survive the games, but is the show of affection ever heartfelt or authentic? Well, The Hunger Games will get back to you on that, coming soon in a theater near you! 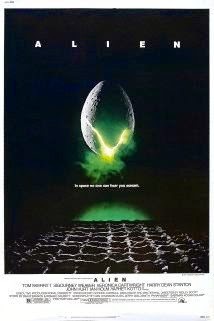 In other words, the film reserves the exploration of that important idea for the sequel. Yet it is necessary to have some answer here, or the movie offers a woefully incomplete emotional experience. As it stands, we just don’t know why Peeta and Katniss behave as they do here, now. Peeta doesn’t bring up his love of Katniss until he is on live TV, for example, which suggests to me it’s a gimmick to help him stay alive. Katniss realizes that the love affair is, similarly, a way to get ahead. Yet, by the same token, Peeta hunts down Katniss during the games with a group of others, which is hardly the act of a soul mate. And then, if he does authentically love her, why doesn't he murder in cold blood the other contestants (staking out the tree where she is hiding), while they sleep? But the point is that the movie just...doesn’t...commit. It doesn’t commit, I submit, because if it did we, as viewers, would be forced to reckon with how we feel about Peeta and Katniss based on the fact that they agree to a mutually beneficial lie. If they aren't pretending, and really do have feelings for each other, then they aren't so bad, so shallow. The movie tries to play it both ways but just seems, again, muddled. The Hunger Games could have commented meaningfully (and perhaps mercilessly) here on how reality stars will do and say anything on camera to achieve their fifteen minutes of fame -- Bristol Palin, j'accuse -- but this point is barely touched upon in the film. Why set up a satire of reality TV and then drop it without comment? There’s a similar problem with the violence in the film. Katniss lands in an immensely competitive, immensely violent game, and yet she survives almost entirely by being in the right place at the right time, and by unexpectedly getting help at the very last instant. She actually kills, by my count, only three of her twenty-three opponents. And of those, she only kills one directly. 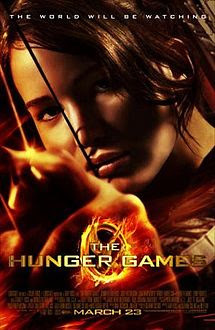 One blonde villain dies when Katniss cuts a beehive from a tree branch, and the competitor is stung to death. Katniss wasn't attempting to kill, however. She was crafting a distraction so she could escape. The second kill is sort of a mercy killing, sparing a villain from painful death by huge, slobbering wild-dog monsters. Katniss actually only murders one person in cold blood. She shoots Rue’s (Amandla Stenberg’s) killer in a fit of rage and adrenaline. Laughably, even the masters of the game keep changing the rules so Katniss doesn't have to kill Peeta to survive the game. Convenient, no? Because Katniss never must make the choice to kill someone like Rue -- an innocent little kid -- the movie never addresses the central question of violence and its morality. Again, I see this development as a failure on the part of the film (and I would assume the book too…) to really commit to its central idea . If Katniss wants to survive the games, she has essentially two options: team-build with the other players and commence an insurrection against the games, or kill her opponents outright. She does neither, at least not in any organized or deep sense. Instead, Katniss hides for the first part of the games, teams-up with Rue for a while, and then manages to endure alone while the others fight. Once more, the hard questions are totally avoided. Is it right to kill another human being for your own survival? For the survival of your family? The Hunger Games features children killing children on screen -- something I’ve rarely if ever seen in a horror movie, for example -- but makes absolutely no commentary on the morality underlying these killings. This way, we can continue to gaze at Katniss as a hero, I suppose. She's more of an innocent bystander than an active participant in the violence. In two words: cop out. 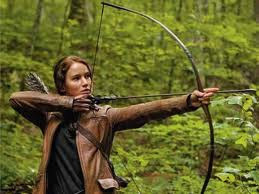 For all of Jennifer Lawrence’s skill in bringing the character of Katniss to the screen, I find that she succeeds without much help from the non-commital script. Katniss is given no meaningful character arc whatsoever in The Hunger Games. She starts our resilient, independent and capable, is judged an "11" by the games keepers (meaning resilient, independent and capable, in other words), and then emerges the winner of the Hunger Games (with Peeta) by being -- wait for it -- resilient, independent and capable. The character has no learning curve in the film. Katniss is in the end as she was in the beginning. Other aspects of the plot are also deliberately vague. The Capitol apparently possesses miracle medicine and -- unbelievably -- Star Trek-type technology which can seems to turn energy into matter and “beam” hostile dog-things into the fighting arena. Where did this high-technology come from in a post-war dystopian universe where resources are limited? Why does the Capitol need supplies from the districts if it can create matter out of energy, or even just teleport real matter? Such amazing technological capabilities are never directly addressed in the film, and thus the universe of The Hunger Games doesn’t quite feel real. It certainly isn't very believable. I submit it would have been much better to see dog-handlers releasing the slavering beasts from cages at the rim of the arena rather than featuring this unexplained and inconsistent technological achievement. For instance, if the gamesters of the Capitol can create animals, generate fires and so forth from energy, they can certainly create a CGI Katniss and get her to do what they want her do. They could have killed the real one, and then had the CGI one act badly, reflecting poorly on her reputation and mitigating her capacity to be a martyr. Problem solved! Indeed, this one technological touch ruins a lot of the legitimacy of the action in The Hunger Games. Katniss might lay low enough for a while to last for much of the game, but there' s no way she could beat a state apparatus armed with Starfleet-era medicine, genetic engineering capabilities, and the equivalent of replicators. That's a bridge too far. Also, and I'm certain this has been said before, there is not a single contestant in the games -- not one -- who looks remotely hungry, or starving. The whole idea underlying this culture is that the Districts live in abject poverty, scrambling for resources and food. And yet everyone looks well-fed, not emaciated. Some of the contestants, in fact, look like body-builders. In the real world, we've all seen, alas, how hunger twists young, developing bodies. It doesn't look anything like what is presented in The Hunger Games, or more aptly, The Well-Fed Games. It's a fact, isn't it, that muscle-mass comes from eating right and vigorous exercise? How are these poor District-ers eating so well, getting so much protein, and working out so frequently under the yoke of The Evil Government? Either the movie should have cast more appropriately, or the actors and actresses should have fasted a bit before principal photography began. But if those changes had occurred, The Hunger Games wouldn't be able to show off hot young nubile bodies, and that, finally, is what gets the Twilight crowd into the theater, isn't it? Does he look like he's starving to you? What about these folks? Skinny, undernourished kids living off the land? Dystopia can't be built in a day. For audiences to believe in a corrupt future world, they must understand why it works or why it doesn't. It needs to be internally-consistent and well-thought out. We also must understand how the filmmaker's feel about that world, and where that world went wrong. What was the human quality that transformed paradise into hell? The Hunger Games doesn't provide much by way of answers to any of these questions. It eschews social commentary and satire in the very era when we see fame whores on every network station in prime time every night of the week. And furthermore it suggests -- in an abundantly bogus fashion -- that a person can survive a tournament to the death without committing almost any violence at all. In terms of dystopian films, this one wouldn't likely survive the first round with Rollerball or Death Race 2000. The Hunger Games looks terrific and is fronted by the very appealing Lawrence, but the film doesn't hold up under the slightest intellectual scrutiny.